So it’s officially spring (although not until 20th March according to astronomers, confusing right?)! This is great news as it means the coats can go back away and out come the jackets! It’s so much easier to get fashion photos outside when the sun’s out and it means we’re not out in the cold and left with damp hair (not a good look)! Although spring isn’t out in full force yet and it’s still a little chilly and occasionally drizzly, we have put our coats to the back of our wardrobes and wanted to show you what we’re wearing as we step into spring! Okay so I know I’m still wearing a lot of monochrome colours (nothing changes! ), but it’s only just the start of Spring! I’ve tried to incorporate a splash of pink into this outfit with both my makeup and clothes and I feel the embroidered blossom detail on both my bag and jacket really shout Spring. Blossom is my favourite thing about this season and I’m loving the embroidered trend at the moment, so you can imagine how I felt when I found both of these items! I love a leather-look biker style jacket and I adore the grunge vibes they give an outfit. I feel that the detailing on this one makes me look a little more colourful for spring and it’s so pretty. I love how my bag matches the jacket too. I fell in love with this bag from New Look as soon as I saw it, but I have to be honest, the quality is terrible. The zip is falling to pieces and I’ve only had it a few months. Straight after talking these photos loads of the ‘teeth’ fell out and it’s really disappointing because it’s such a pretty bag. This embroidered flamingo shirt from Topshop is the best item of clothing I’ve bought in so long! Did I mention how I love the embroidered trend? The little flamingos on the sleeves make what would normally be a basic and slightly boring white shirt look so much more exciting! Topshop have really paid attention to detail here with the little pink button, again making a simple shirt look so much better. But that’s not it, there’s also flamingos on the back of the shirt which I LOVE, which you’ll see if you keep on reading! I love how a shirt like this can be worn in a smart and sophisticated way but it’s also versatile and can be styled with a jacket and ripped jeans for a more casual look. I completed this outfit with some Dr Marten shoes and like the shirt, I love how these can be worn in a smart or casual way. I try to wear these as much as possible because I’ve had them for a year and they’re still not worn in, which is why they’ve been featured so much on here! I do love that this outfit can also be styled with some Old Skool Vans for an even more casual feel and I really feel that wearing fish nets under jeans looks so good with trainers. I’m forever wearing fishnet tights or even just normal thin tights under jeans as it’s just another small detail that can really make an outfit. And hey, fishnets under jeans is so in right now, so I guess I’m finally fashionable! The last thing I want to talk about is my bargain pair of sunglasses from Primark! They were £2 and I love the purple tint in the lenses. I know it looks a little rainy and gloomy in the photos with the puddles on the ground, but trust me the sun did actually make an appearance that day and these sunglasses came straight out! Rachel has already said about how she’s wearing monochrome colours in this ootd and my outfit is no different really! I’d love to have shown you a pretty pastel outfit but I don’t really have any colour in my wardrobe… yet! As soon as the Spring stuff hits the shops I promise I will try and buy some more Spring themed clothes. That being said I was really feeling this outfit! I am SO in love with my denim jacket, I managed to pick it up in the New Look sale and I’ve been jazzing it up by sewing patches on to it. Only downside to the sewing part is that it’s time consuming and I have no time, but hey the end result is fab! I love patches as I feel like they give you the opportunity to show your personality on the clothing you wear. Of course an ootd wouldn’t be complete without my trusty docs, I love these boots so much, they’re probably my favourite and most comfortable pair. For me, nothing says spring like a nice gingham number! Perhaps it’s because when I was at Primary school throughout Spring/Summer you’d wear those cute gingham dresses! When I found this dress in H&M I knew I had to try it on. It’s not really my normal sort of style but it just caught my eye and as soon as I had it on I knew it had to come home with me! I love the off the shoulder style and the sleeves are a really cute touch. The material of this dress is quite thin so I feel like it’ll be perfect for the upcoming months! I feel like we need to take a second to appreciate these sunglasses, can you believe that they were £2?!?!? The pictures don’t really pick it up too well but the frames are holographic, something that I’m a huge fan of! The lenses are that mirror style which everyone’s been loving since last Summer. I’m looking for any excuse to wear these at the moment, if there’s a tiny bit of sun when I’m driving I pop these bad boys on! This dress does have an elasticated middle but I added a belt purely to create more of a waist and I felt like it looked better. Without this belt to me my outfit looked incomplete! As I’ve already said I’m not one for wearing colour so I thought the pop of colour on my lips and nails was enough. If I was wearing loads of colour it may have been too much having bright lips and nails! What are your favourite things to wear now the Spring season is here? 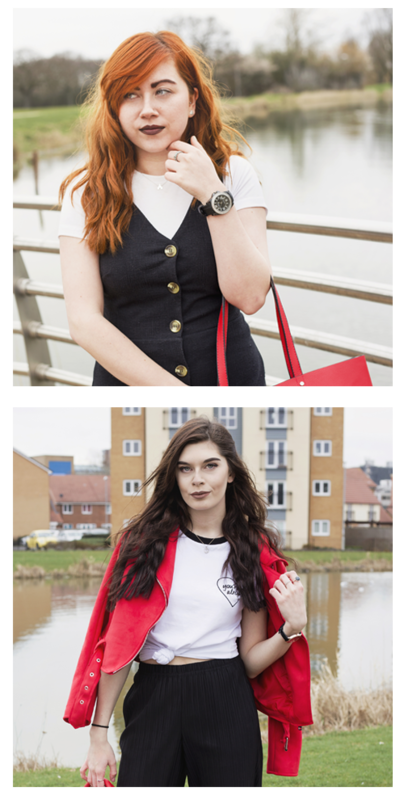 Hopefully we’ll have a few more fashion posts up now the weather’s getting better! You both look lovely,great looks. Guys I absolutely ADORE both outfits! I could definitely see myself wearing both. I was lookin at the cheeks dress in H&M just yesterday and I think I really need that flamingo shirt haha! That flamingo shirt is amazing! Gorgeous looks! Love the flamingo shirt and the embroidered denim jacket.